Superbly situated villa with gulf access. Ideal location handy for shopping and restaurants, perfect for the boating family or fishermen. . The villa is in a select position handily placed for excursions, Local amenities include golf, fishing, beach trips and sightseeing. Fish from the dock or just enjoy the beautiful view. Fantastic view of the water from the Lanai or master bedroom. Our villa is fully-equipped with all the home comforts to make your stay in our home the best vacation ever. The master bedroom has a king sized bed and a desk over looking the canal. The master bath has a walk in glass enclosed shower. A 32' HDTV is in master bedroom. The 2nd bedroom has a queen size bed with a fan and flat-screen TV with built-in DVD player. The 3rd bedroom is setup the same as the 2nd bedroom. Separate formal and informal living spaces. The family room over looks the pool and the canal. Watch TV on a 42' HDTV with cable or enjoy a movie on the DVD player. Kitchen: This kitchen has all new (2011) LG stainless steel appliances with granite counter tops! The kitchen is open to the breakfast nook, breakfast bar and family room so the cook can socialize while working. The kitchen is well stocked - including extras like blender, waffle iron, and quesadilla maker. The refrigerator has french doors and lower freezer double doors for lots of space. The stove has two ovens to allow for many different items to be cooked simultaneously. Furnishings: House has all new furniture and freshly painted 2010. Mattresses and pillows all have protective covering. Enjoyed the well kept home. We have been visiting Punta Gorda for many years renting for 10 days at the time. The Castaway Breeze was by far the BEST home we have stayed in. The layout was great, the home was sparkling clean and the location in Punta Gorda was fantastic! We spent time in the pool enjoying the peace and quiet of the neighborhood. We enjoyed watching a family of ducks from the dock. We could not ask for better. We would recommend this house above any other we have rented in the past. The owners went out of their way to make things comfortable for us. My husband was re-cooperating from unexpected surgery and enjoyed just relaxing on the lanai. Wish we had found this property for previous visits to Punta Gorda We are already looking at our schedules for a return visit! This was our second year staying in Punta Gorda and the first at "Castaway Breeze" we love the small town feeling with the availablilty of the Big City only a short drive away. The listing is very accurate regarding the location, layout and amenties of the home and the house was very clean and well maintained. This is a large home with both formal and informal areas with very high end furnishings and appliances. The owners provided us with excellent customer service during the enquiry and application phases and greeted us personally at the home on our arrival and gave us a house tour and made sure we knew where everthing was and how it worked. This home is just a very short drive to the Fisherman's Village area and the downtown waterfront and numerous local dining options. The Peace River and riverfront has many parks for beautiful sunsets, marina's for tours, fishing and boat rental as well as the War on The Peace(dragon boat races). If you crave the Big City life and the malls and shopping, Port Charlotte is just a short drive over the bridge north and Fort Myers a short drive south with its outlet malls, Fort Myers Beach, Sanibel and Captiva Island. Sports fans will like the available fishing charters, local short track stock car racing, Charlotte Stone Crabs AA baseball and many local Grapefruit League baseball teams in the area. We would recommend this home to both family and friends and rate this as a five star property. Many thanks for allowing us the use of your beautiful home and we can hardly wait until next year. It was our lucky day when we found Castaway Breeze. 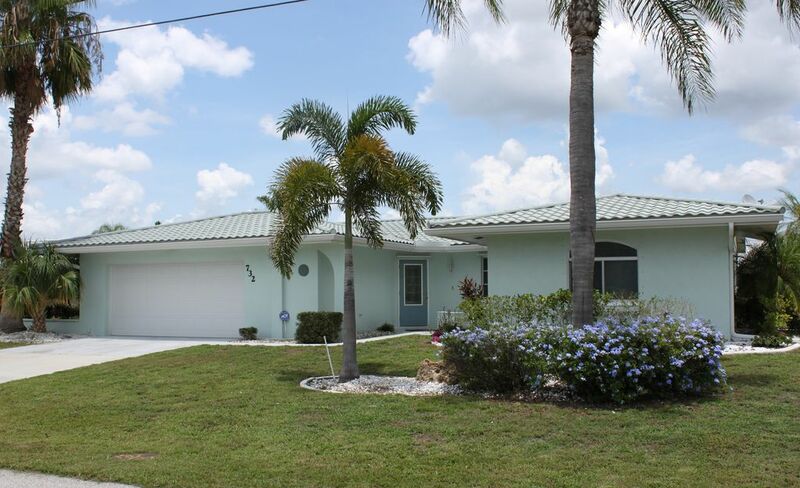 The house exceeded all of our expectations with the perfect location to enjoy everything Punta Gorda has to offer. Bring your boat, use the lift and enjoy easy out to the harbor. No boat? Enjoy the lanai and swimming in the heated pool. The pictures showed exactly what the house offers, but it was better than that. This is truly our “home away” from home. Weekly 1250-1500; Monthly 2000 - 3250 Monthly rentals begin on the first day of the month with checkout on the first day of the month. $500.00 refundable security deposit upon rental agreement.